A perennial with palmately compound leaves, racemes of white, rose yellow, or blue flowers, and pods containing beanlike seeds; used for forage; green manure, etc., 1-2 foot high. Leaves long-stalked; divided into 7-11 oblong-lance-shaped segments. Flowers more often blue; pea like; in a showy raceme; April to July. Found in dry soils, open woods. New York to Florida; West Virginia; Ohio, Indiana, Illinois. The name of the Wild Lupine means wild wolf. Origin of the name is unknown. Paiute name: “Kao sigi”; Shoshone name: “Cupi chuk”; Warm Springs Indians name: “Wapeayta”. The tea of the seeds helps failure to urinate. Native Americans dank cold leaf tea to treat nausea, failure to urinate, and internal hemorrhage. A fodder used to fatten horses and make them “spirited and full of fire”. Seeds are Poisonous. 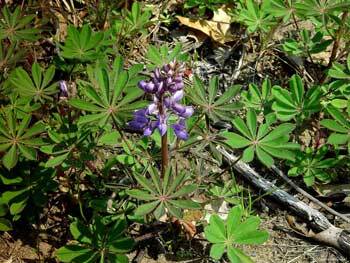 Some lupines are toxic, others are not. Even botanists may have difficulty distinguishing between toxic and nontoxic species. Best to leave alone if inexperienced with this one.